At a time before and during the Civil War, Alexander Graham (1800-1865) and his wife, Elizabeth Purcell Graham (1806-1888) lived in a Greek Revival cottage on the east side of the Cheraw to Fayetteville Road, now Highway 401, two miles above Gilchrist Bridge on the Lumber River, in what was then the upper reaches of Robeson County. That part of Robeson County where the home was located was to become a part of Hoke County upon the formation of Hoke in 1811. Many of the Graham neighbors were related; Mrs. Graham’s sister lived across the road in a two story house (still standing), two of her brothers not more than two miles distant and an uncle at Mill Prong, three miles distant. All had large families. The Grahams, like their other neighbors, related and unrelated, were Presbyterian descendants of Highland Scots. Deep tragedy was unknown to them and while the Grahams had lost two children in infancy, six others had survived to reach their majority. Two sons served in the Confederate army. Their lives were tranquil until the arrival of General W. T. Sherman and his army. Antioch Presbyterian Church stands today between Red Springs and Raeford on Highway 211, some ten miles east of Gilchrist Bridge and the Graham home. The present church building was constructed after the Civil War but replaced an existing building on the same site. In a typed narrative dated May 24, 1932, A. D. Currie recites his fateful connection to the last hours of the life of Alexander Graham. Mr. Currie, writing 67 years after the event, was likely a boy too young for Confederate service but not too young to have the event impressed on his psyche for the remainder of his life. Currie, from Laurinburg, served in the North Carolina legislature as a member of the 1925 House of Representatives. It was a time of great devastation and disorganization. The coffin maker dug the grave. According to A. D. Currie, the coffin maker and Graham’s widow were the only attendants. Wash “changing his camping quarters her and there” managed to save the eight mules belonging to the Graham daughter and according to A. D. Currie, had his revenge on certain individual Yankee soldiers, which is another story. Within ten days of her husband’s death, Elizabeth Purcell Graham, was to face another tragedy. Her son, Thomas Scott Graham, was mortally wounded on March 19, 1865, at the Battle of Bentonville, and died in a hospital in Raleigh on March 23, 1865. The graves of the father and son rest in the Robeson County Purcell graveyard, now in Hoke County. Shift forward to 1973. Ella Alderman McLean, the grandniece of Elizabeth Purcell Graham, and her son, Alderman McLean, contacted the author and urged a purchase of the old Graham house which had to be moved from its original site or face demolition. The house was purchased, moved four miles to the vicinity of the Riverton community in Scotland County, where it stands today, after renovation which was commenced with the enthusiastic assistance of the grandniece and her son. A kitchen annex was constructed using materials from another antebellum structure and today is a separate apartment. 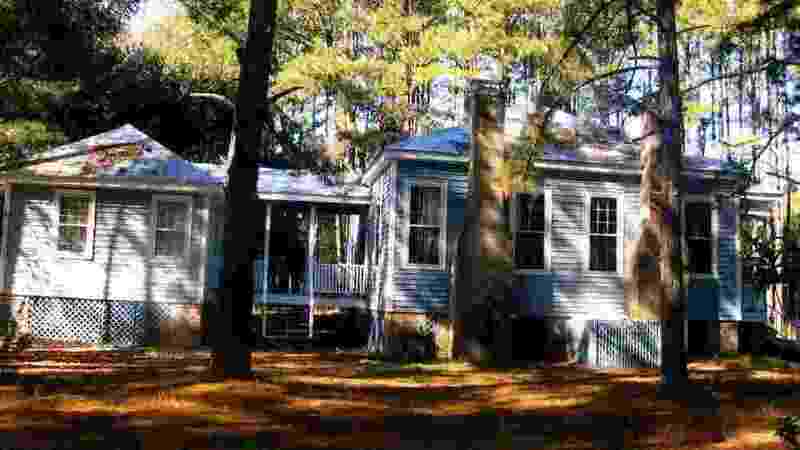 The house has several interesting features: an eight foot wide center hall paneled with heart pine, ceilings ten and a half feet tall, doors and windows of the same height, four chimneys, one for each of the four rooms. It sits on brick piers four feet off the ground. The Graham family of two parents and eight children made do with this four room residence with a separate kitchen which probably contained a dining room. The house was located on a 430 acre tract belonging to the Grahams resulting from the 1851 division of the lands of John Purcell, the deceased father of Mrs. Graham. In the 1860 census, Graham was listed as a farmer with 800 acres of land. Strangely enough, the story of Alexander Graham was not widely known. The Lumber River Scots, the family history for the Grahams, meticulously recites the birth and death dates for Mrs. Graham and all the children, yet it does not mention the birth and death dates for Alexander Graham nor the circumstances of his death. In addition to A. D Currie’s narrative, correspondence is available including a letter dated July 12, 1937, from Dr. William A. McLeod, Presbyterian minister in Texas, to Dr. A. C. Bethune in Raeford, referring to Alexander Graham as having been “killed in 1865 by Sherman’s bums”. 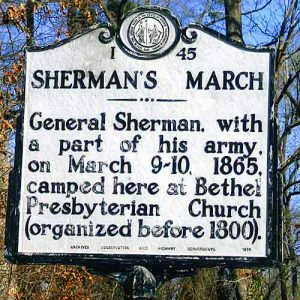 The author through the years had noticed only the coincidence of the date of death on the tombstone of Alexander Graham, March 9, 1865, as being the same date that General Sherman spent the night at Bethel Church. Since Graham was sixty-five years of age in March, 1865, the author assumed that the stress of the arrival of Sherman’s army had resulted in a natural death for a man of his age at that time. The research and information from John C. Kelly of Rockville, Maryland, descendant of local families and native of Hoke County, and Dickson McLean, Jr. uncovered the answer to this mystery for which the author is much indebted. 1 The Civil War in North Carolina by John G. Barrett, University of North Carolina, Press, 1963, p. 301. 2 The War of the Rebellion, a Compilation of the Official Records of the Union and Confederate Armies, Series 1 – Volume XLVII, in three parts, Part II Correspondence, Washington: Government Printing Office, 1895. 3 The Civil War in North Carolina, pages 301-302.